Three glorious days on Newmarket's wonderful July course - get there if you can - and some very good, if perhaps not top class, racing. Day one of the July meeting features the Bahrain Trophy, the July Stakes, and the Princess of Wales's Stakes. A race for three year olds run over the rare pattern race trip of a mile and five furlongs. Some decent horses, including Shantaram, Masked Marvel and Kite Wood have won this in the last four years, and it's a reasonable pointer to the St Leger, Masked Marvel having gone on to win the fifth Classic and Kite Wood finishing second. Dare To Achieve is the favourite on the back of a six length win in a maiden, but that seems strange to me. Yes, he was second to Remote in a maiden which is working out very nicely two starts back. But he broke his maiden in a Class 5 event at Pontefract, and top class horses don't normally run in Class 5 maidens ever! There he beat a filly called Astorgs Galaxy, but she was beaten even further - ten lengths - by Butterfly McQueen the time before and is probably no good. In short, whilst I appreciate this chap must be showing plenty at home, he's terribly short in a race where horses with established form are likely to improve for a move to this trip. Most obviously in that group is John Gosden's Feel Like Dancing, second in the Queen's Vase over two miles, and looking for all the world like he ran out of puff there. Before that, he'd been outpaced over ten furlongs here, and I reckon this might be close to an optimal trip for him. Johnny G has won the last two renewals of this race, and he must have had plenty of horses he could have aimed at the hat-trick bid. That Feels Like Dancing gets the nod is perhaps significant. My fancy beat Boite and Ray Ward last time and, while the margin at the line wasn't that great - a length and a half, and a neck - there's no obvious reason for the vanquished to spin the table here. Testudo may be of more interest. He's a last time out maiden winner, like the favourite, and if that progressive profile is good enough to make one of them a jolly, then the other ought at least to merit a second glance. Testudo may have won his maiden over ten furlongs, but he's bred for this trip all right - by Duke Of Marmalade out of a Linamic mare. He was getting on top at the line there, and the second has won since. That was a Class 5 contest too, and he was beaten eleven lengths when both he and Dare To Achieve ran in Remote's maiden mentioned above. He'll be seen in better light here, and has apparently been working very well, but it is a huge leap of faith to go from a Class 5 to a Class 1, for both of them. I'm sticking with Feel Like Dancing, and also banking on him in the placepot so that I can spread out a bit in the middle of the perm. A six furlong sprint for two year old boys, this race sees the established Royal Ascot form - represented by Sir John Hawkins and Jallota - meet another group of unexposed debut winners. It's hard to gauge the level of most of the once raced brigade, but we can be confident that Sir John Hawkins' Coventry third is strong form. Historically, this has been a good route in, with six of the last fifteen winners - including the last two - having been placed in a Royal Ascot juvenile race last time out. Sir John Hawkins has a strong claim on that basis. His trainer has only run three horses in this in fifteen years, and they finished 214. Others to consider are Richard Hannon's pair, Brown Sugar and Anjaal; and, Godolphin's Figure Of Speech. Although Jallota isn't certain to replicate his Coventry fifth, he is a big price at around 16/1. Third of the Group races is up next, this time over a mile and a half and, while it's open to three-year-olds and up, none of the Classic generation are entered. The jolly is Universal, who ran a blinder at Royal Ascot, but had a hard old race there. He's a tough as teak type so might be able to shrug that off, and I like him a fair bit. But he might not be able to shrug that hard race off too, and for that reason I won't be wagering him. In fact, I won't be wagering anything in what is a very open race. 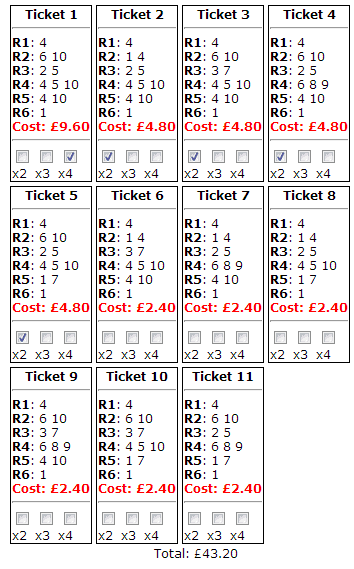 It's fairly easy to make a case for all of them, so the game here will be to get through the placepot, which may well still contain most of the tickets at this point. Universal will take them along probably, which is another feather in his already down-y cap, as tactical speed here is favoured. Alongside him, I'm going to take Danadana, a capable horse, but one which is stepping up to a mile and a half for the second time. It might bring about improvement, but that would have been an afterthought given that he's raced at a quarter mile shorter for his last six races. He did run fifth in a big field Royal Ascot handicap over this trip, but was beaten far enough, albeit on ground he wouldn't have enjoyed. And on B, I'm chancing distance specialists, Ahzeemah and Wild Coco, neither of which have done much wrong. A very competitive handicap, and my eye is first drawn to the Andrew Balding-trained Soviet Rock. Balding won this last year - when we backed him, tipped as he was on here! - and he also won it back in 2008. In between times, he also saddled the 20/1 second in 2010. This is the right time to catch the yard's 3yo handicappers too, and Soviet Rock could well try to make all a la Stature. It's a pace favouring track, especially on fast ground, so he'd have a decent chance at around 14/1. But there are others which like to get on with it today, including the well-backed Maputo. He disappointed when fancied at Royal Ascot, but had previously run up a sequence. The key to him seems to be small fields and an easy lead. He won't get either here, and so he's one I can overlook. Pasaka Boy might be interesting. He's likely to sit just behind the pace and a win two starts back in a similarly open Epsom handicap gives him a shout at around 25/1. The two Arab-owned unexposed lads - Matrooh and Tarikhi - have chances to win too in a wide open affair. They're definite placepot fodder but offer little value from a straight win perspective. And Goodwood Mirage is progressive, and has a likable attitude, both of which mean there might be a sliver of playability about a price of 9/1. Perhaps the most interesting thing about this race is that seven of the last nine runnings have been won by a filly making her debut. Oriel looks over-hyped to me in any case, and clearly shows more at home than she has to date on the track. Thus, I'm looking at the unraced young ladies, the pick of which might be William Haggas' Amnesia. She's got a nice sprint/mile pedigree and one assumed she's at least pretty good to be starting out here. Of those with experience, Oriel has far less progression after three starts than the once race pair of Grevillea and Qawaasem, and I'd prefer those to the hype horse. It's not a race I'll be betting in, but I will be trying to get Oriel out of the frame for the placepot. This is Montiridge's to lose, plain and simple. He ran a blinder behind Gale Force Ten in the Jersey Stakes, and this return to a mile should be fine. Fast ground will be no bother and, as long as he's ridden handily so nothing gets a flyer on the front end, he should win. I've backed him in a small double with Wadi Al Hattawi at Donny ten minutes earlier (4/5 and 15/8 last night). I'm also banking on him in the placepot and will place lay if it's worth it. Chief dangers could be Alhebayeb if he handled the ground - all of his best form is on soft; and Ashdan, making a belated seasonal reappearance after getting put in his place by New Approach in the Dewhurst last year. There's no shame in that form in this context, however, and he might make Montiridge work hardest. Finally, did you know that BetVictor are offering a free bet on Saturday to the value of your average stake if you have four bets today/tomorrow with them at Newmarket. Say you have a tenner and three fiver bets (£25), they'll give you a free £6.25 bet on Saturday in the July Cup. It's sommat for nowt, so not bad. 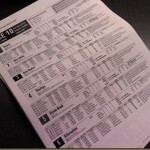 excellent article as always I’m having a small bet on each of the televised races.Feel Like Dancing,Sir John Hawkins,Ahzeemah and Soviet Rock. Another great placepot Matt – well done!